Rio Alto and Virginia Mines have both been taken out. Not much out there to buy in the jr space. I've been buying quite a bit of NGD today although i can't say it's a jr. and I'm waiting on Argonaut to dip below $2 cnd. The royalty plays look the safest here. Stopped out of trying to initiate long positions in GLD and GDX. 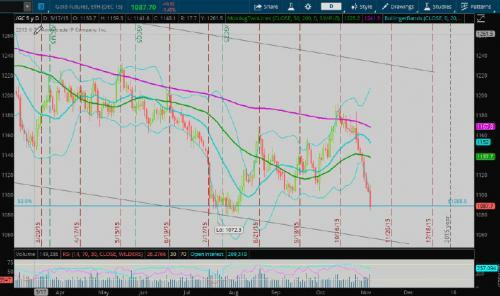 GOLD quickly retracing almost back to the break out lows here. Strong supportive convergence at @ 1160-1175 of 2-4 trendline and 50% FIB. If this goes could well be in for a drop to $1000 area in Wave 5. 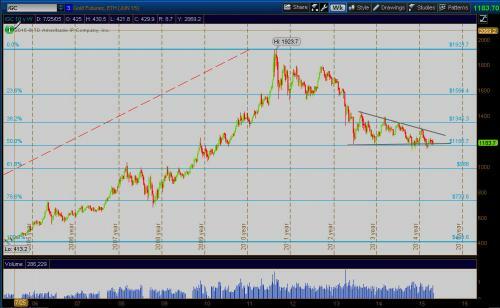 Here is GLD with the 2-4 trendline in blue and FIBO retracement of golds LT impulse up to the all time highs. 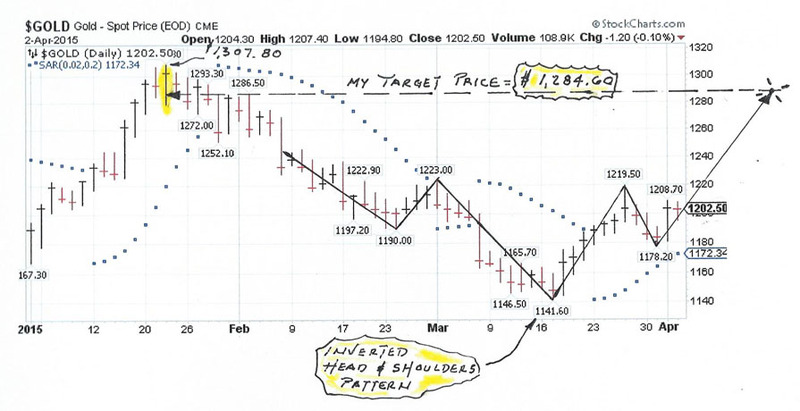 Looks to me like Gold is in the process of making a inverted head and shoulders pattern. My price target is $1,284.60 which would take it into the lower portion of the previous high bar at $1,307.80. Hate to say it but things are looking pretty dismal... consolidating at bottom trendline of this huge bearish descending triangle. So I am back to anticipating $1000 when this well defined support level gives. here at the .50 FIBO and prior significant low at 1080-1090. Watching the reaction carefully here. I am leaning to an insignificant one and a continued rapid decline once this level breaks making a good shorting opportunity. It looks to me like gold is starting to make a move up right now. I did some work on projecting just how high it will go. I came up with the price of $1,143.00 Just my two cents anyway. It would be nice to be right for a change. 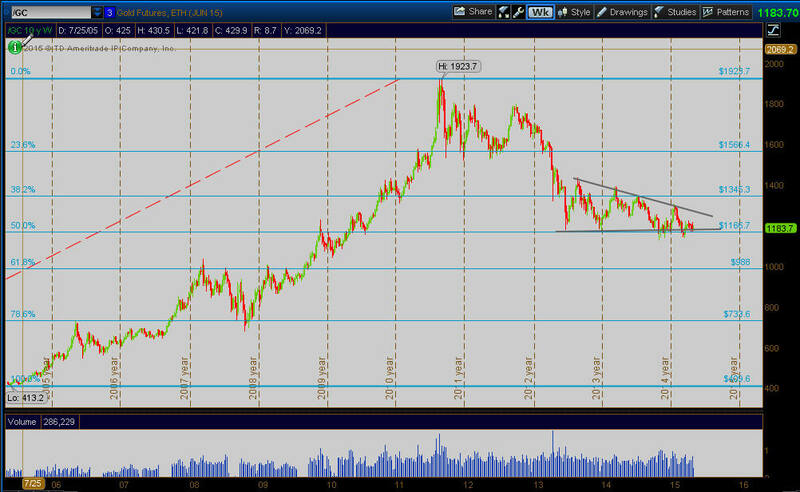 Gold is still entrenched in a LT bear market by all technical measures. 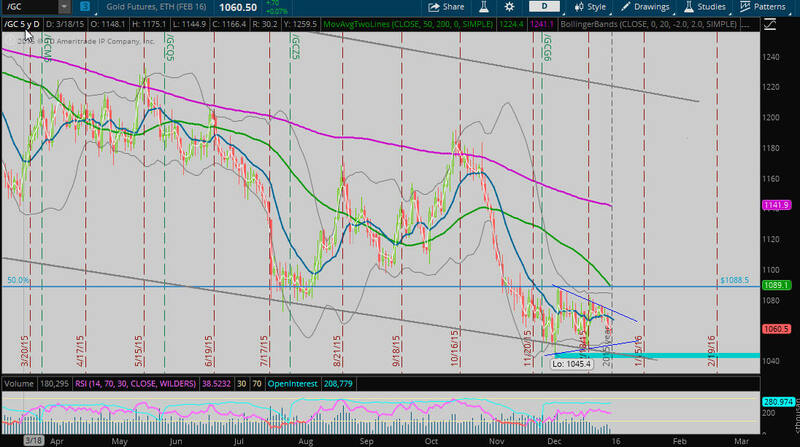 I don't like shorting gold but may do some once this area gives. 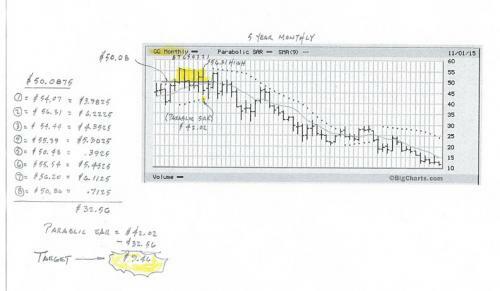 Both my RAFF LT and FCS IT systems are on SELL for GLD, DGZ is the inverse ETF. Another factor we are soon LEAVING golds well established period of FAVORABLE SEASONALITY. I find the gold/silver ratio interesting. Historically it has been about 16. 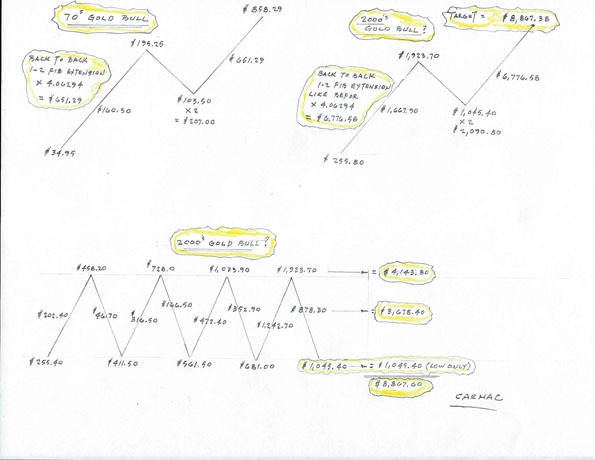 About 7 weeks ago gold( $1176.84) and silver ($15.71) for a ratio of 74.91. This morning gold is $1056.91 and silver $14.12 for a ratio of 74.85. Will 74 be the new magic number or is it time to invest in silver rather than gold? 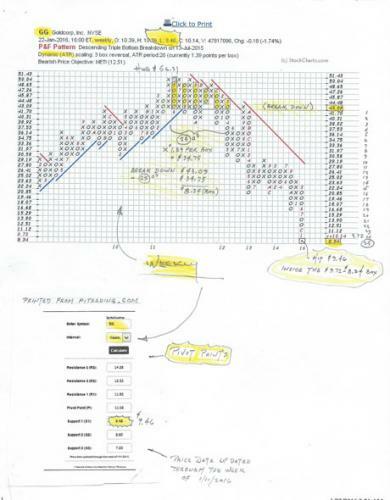 With gold at $800.00 a 20/1 ratio puts silver at 40. I guess I might be a little naive of the manipulation of the powers that be. I don't know how much physical silver exists but it is used more than gold in industrial and technological applications. So what happened to the old supply/demand. can the price really be manipulated forever? Frustrating. They're both in established LT / IT downtrends and with the threat of Fed rate hikes and industrial metals also tanking which silver can be thought of, not a good time to think positively about either. This just doesn't look or feel like any kind of LT bottom to me. 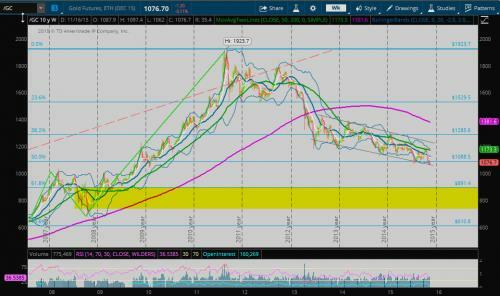 I continue to have a bearish outlook on GOLD. It made a brief stab here at showing some signs of a turn in the very short term and failed miserably. 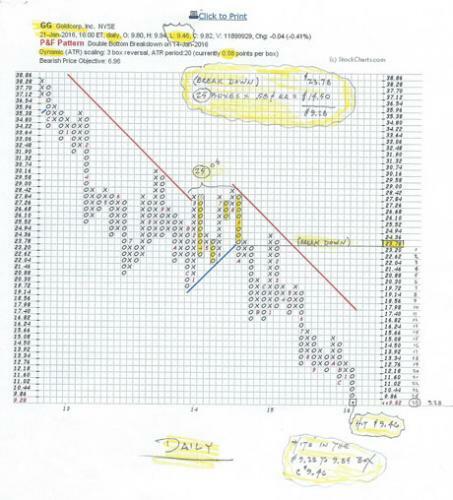 The 50 FIBO of its entire secular rally at first held in July but then broke in early November and now Gold has been consolidating between it and the bottom trendline of a downsloping channel (typically bearish) and well below the 200 DMA (purple) that held it on prior sustained attempts. It is also below the 50 DMA (green) and the XPL MA (blue) It is coiling (BB shrinking) so soon should make a break. Bottom Line : A close below 1045 I will short gold (DGZ) for its final Wave 5 decline. I am going to take a do over on my post # 52 with a new projection. There is an article by Marc Chandler January 6, 2016 called "Is gold breaking out" on the Financial Sense website. 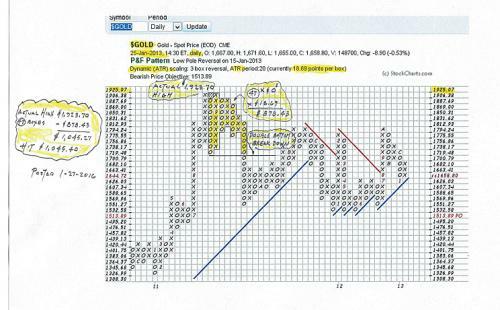 He shows that the minimum chart measurement for this gold projection is near $1132 I also show the P&F chart at $1132.69. Hope I am right this time. No one is wrong 100% of the time are they? 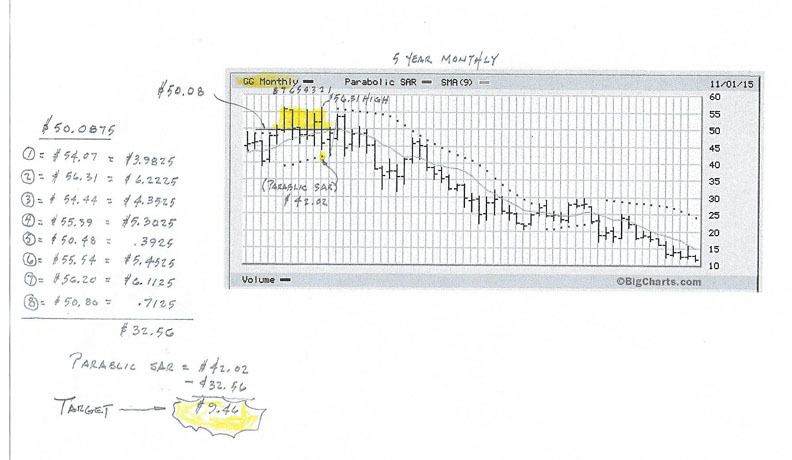 Is it possible that GG hit bottom on January 21, 2016 at $9.46. I hope so because if it didn't the work I did won't look so good. 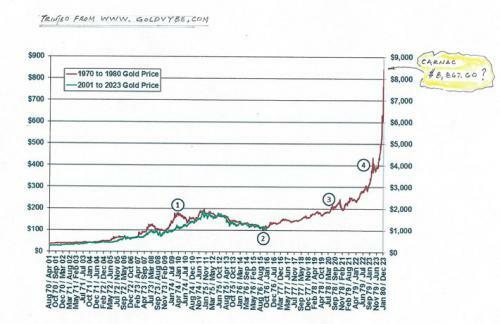 Has the gold market actually bottomed? Here is my take on it. Just read an article on 321 gold.com today February 10 called Gold's Bucking Back test. 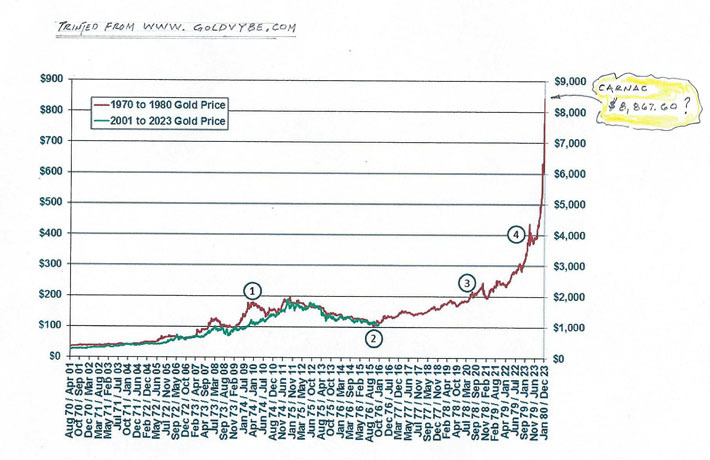 The article shows how similar the 70's gold bull market looks at this time to this 2000 gold bull market. I took a picture off their site of this chart to show here. This looks very close to what I have thought for some time see my work-up below. My wife thinks I have just took off into outer space maybe she is right? !